Taking a power nap has many benefits for your brain, heart, stress levels, and mood. A short nap of 10 or 20 minutes in the middle of the day can do wonders for your productivity, alertness, and memory. A power nap will leave you feeling refreshed and increase your energy levels. Far from being a sign of laziness, the most productive workers use short naps to increase their effectiveness. In fact, more and more companies allow for a midday nap because it can enhance cognitive function. So, if you feel like taking a short snooze in the afternoon, then it’s good to know that you can benefit from a 30-minute power nap. In this article, you will find out why napping is good for you. You will also learn how long a power nap should be. 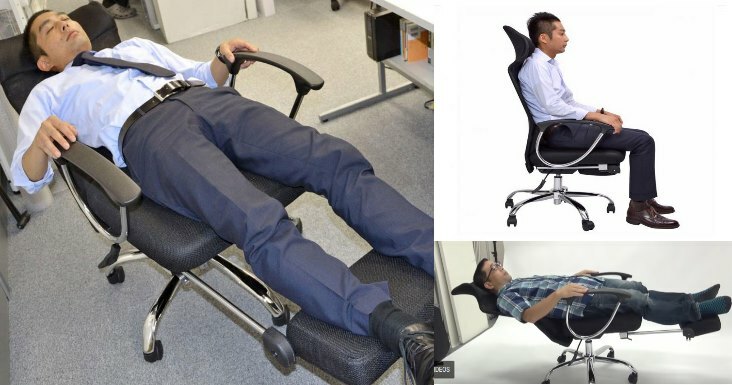 At the end of the article you’ll find all the details about the ultimate office chair for napping. A power nap is a short sleep in the daytime, usually lasting between 10 and 30 minutes. Many people prefer taking a nap in the early afternoon when they naturally feel drowsy or sleepy. What is the Perfect Nap Length? Generally speaking, a short power nap of 10-20 minutes is good for a quick improvement of your alertness and energy level and will enable you to get back to work quickly. A nap of about 30 minutes will provide you a mental sharpness similar to the 10-20 minute nap, with that sharpness lasting a bit longer, but the downside is that people tend to feel groggy immediately after this kind of nap. A longer nap of 60 minutes is good for your cognitive memory. It can help you remember faces, names and facts, but the downside is some grogginess upon waking. A long nap of 90 or more can provide you a full sleep cycle which improves procedural memory (such as riding a bike or playing the piano) and creativity. Waking up after it usually has minimal amount of grogginess. So to summarize, if you are looking for a quick boost or recharge, you are looking at a short nap length of about 10-20 minutes. However if you are looking for deeper sleep rejuvenation, you are looking at a longer nap of about 60-90 minutes. Let’s look in more detail how power naps can work for you to improve memory, increase learning, become more efficient and generally function better. One of the instant benefits of taking an afternoon power nap is that you will feel more alert. Enjoying a short nap in the afternoon can also help boost your productivity at work. However, a long nap seemed to negatively impact on alertness and productivity. The benefits to your cognitive function of taking a nap after lunch can also help to boost your memory. Studies have shown that regular napping can benefit your long-term and short-term memory. Further reading: Proven Brain Foods to Boost Brain Power, Focus and Memory. Dozing after lunch for 20 minutes or so can also improve your energy levels and increase your performance. The researchers believe that an afternoon nap may contribute to stress-releasing process, which can help reduce mortality from coronary heart disease. Find out how the cardiac diet can be good for your heart. Enjoying a short siesta can also be good to manage high blood pressure. Learn about other natural ways to manage hypertension naturally and prevent strokes or heart disease. Having a power nap after lunch is also good for your health in general because it can boost your immune system. Researchers have come to realize that getting enough sleep is necessary to strengthen your immune system. There is also evidence that a brief nap can also give your immunity a needed boost. A power nap is one of the great hacks to quickly get your immunity working as it should. You can also learn what else you can do to prevent infection due to a weakened immune system. A 30-minute power nap can also be good to deal better with stress and avoid the consequences of being constantly stressed. Getting enough sleep helps your body produce hormones that are associated with lower stress levels. Taking a nap can help to normalize hormone levels if you haven’t had enough sleep. Learn more about why getting an afternoon nap is just one of the effective remedies for dealing with anxiety and stress. Having a short sleep in the afternoon can be one of the ways to improve your mood and manage depression. For more ways to deal with mild depression naturally, please read this article on natural remedies for anxiety and depression. You may also find that serotonin supplements can help if you suffer from depression. A power nap after lunch can be good for male sexual health because it boosts testosterone levels. Power naps can really help to improve your mood, alertness, learning ability, and general well-being. 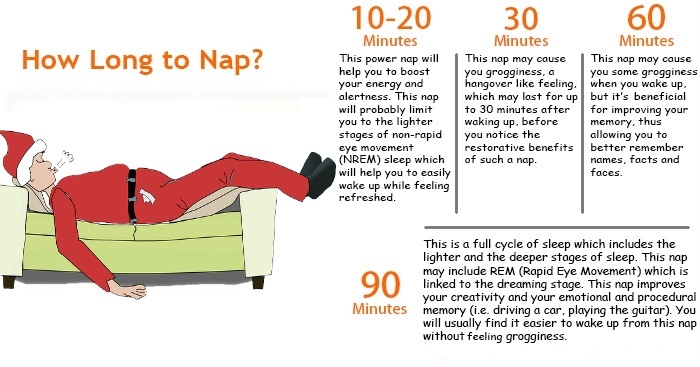 What can you do to enjoy the perfect power nap? And when is the best time to go for a nap? Most studies show that your body naturally becomes drowsier in the 2 or 3 hours after lunch. So, generally, power naps are best enjoyed in the early afternoon or not long after eating lunch. Most of us feel tired between 1 and 4 pm, so try to fit your nap during those hours. Don’t make it later otherwise it can interfere with your ability to fall asleep at bedtime. Don’t nap too long. A power nap is never meant to be too long. Usually, napping between 10 and 30 minutes is the ideal length of time for a nap. If you nap too long, you may feel drowsy for the rest of the day. When taking shorter naps, it is recommended to sleep partially upright to make it easier to wake up and to avoid falling into a deeper sleep. Create the right environment. You will fall asleep for a short nap easier if you are in a dark place that isn’t too warm. Try relaxing beverages. You can avoid the stimulating effect of caffeine by taking a relaxing herbal tea before or after your power nap. Have a light snack. Did you know that there are some foods that make you sleepy? Take a glass of warm milk or eat a banana to help you fall asleep faster. Remove distractions. Make sure that you won’t be distracted during your 10, 20, or 30-minute power nap. So, put your phone on a flight mode if using it as an alarm clock. Try the 4-7-8 exercise to fall asleep. Learn more here about this exercise that will help you fall asleep in no time at all. Try to nap at a regular time. If your schedule allows for it, try to schedule a power nap for the same time every day. This way you teach your body to expect the nap and you may find it easier to fall asleep. The “lay flat office chair” looks like a a regular leather-finished office chair but it can easily convert to a completely perpendicular office bed. It reclines back to a nearly perfectly horizontal position, allowing you to completely stretch out for an office power nap. The chair is available on Thanko (Japan) for ¥29,800 (about $270). However if you look for a cheaper alternative, check out this recliner napping chair in Amazon. It has a 170 degree reclining feature – not a perfect horizontal position but it’s still good enough for a quick power nap! I wonder how you could nap for a dew minutes and be woken up with an alarm without a start? Then you could sneakily do it in the office. I did accounting years ago. I used to have a battery powered alarm clock in my car. I used to take a 20 minute nap in my car on my lunch hour. Having suffered with chronic pain for many years, I always wake up 6 to 10 times a night in pain and having difficulty moving. I’ve always had to nap and am thrilled to finally hear that it is okay to do so. My naps last from 60 to 90 minutes and depending on the night before, I can even take 2, one in the morning and then in the afternoon. I would be a basket-case without my napping. Finally someone is understanding the need for them! If I nap for too long I get a headache. And I enjoy the nap SO MUCH that those little naps don’t cut it. Love me some sleep! I have a lot of back pain and for the past 33 yrs i nap for 2 hrs after dinner..get up at 9:00pm and then go to bed at 3:00am..sleep exactly 6 hrs..so i get 8 hrs of sleep a day. I am 71. It works perfectly..